You�re viewing our Sausage Maker curing culture Bactoferm T-SPX (Pediococcus pentosaceus and Staphylococcus xylosus). Less acidity and sour flavor but, enhances the aromatic flavor of fermented meats. It's primary function is to assist in moisture removal during the drying phase. Use for products needing at least one month's time for fermentation and do not ferment with this product over 75� F.
We can answer any questions you may have about our products. 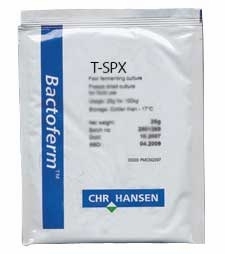 Scroll down to view our Sausage Maker curing culture Bactoferm T-SPX. Instructions on making 10 lb. increments included. We HIGHLY Recommend reading and understanding the Art of Making Fermented Sausage book before attempting to Dry-Cure Meats if you are unsure about any of the complexities involved. Summary: For slow and minimal acidification. Fermentation ends when sugars are used up for lactic acid production, at which point the pH will steady (or rise) and moisture removal will be main safety hurdle (<0.91). This culture is a curing and flavor enhancing bacteria, the pH level should not drop under 5.3. This will ensure great taste and color to finished product. For slow-fermentation and large diameter salami, or products with diameters of >3�. Slow culture targeted for fermentation temperatures 65�F-80�F. For traditional fermentation the temperature should not exceed 75�F. Typically sugar is used for these products. This culture is for products that take months to fully complete (includes drying), and can be used for slow fermented small diameter products as long as safety hurdles are overcome, i.e. Water Activity level (<0.91), curing with #2, etc.). Use: After seasonings and spices have been effectively mixed into minced meat the culture is introduced and also thoroughly mixed. For every 10 lbs. of meat: dilute 1/2 tsp. of culture in 1/2 cup distilled water (or chlorine free tap water). Let sit for 15-20 minutes for bacteria to �wake-up� then pour over mixed meat and re-mix thoroughly. Make sure meat stays cold throughout mixing process. Use InstaCure� #2 (Nitrate) with this culture. Storage: When not in use keep culture sealed and frozen. Shelf life of frozen cultures is 6 months, while unfrozen cultures will last a matter of weeks.